Jonathan Smith (born January 17, 1971), better kent bi his stage name Lil Jon, is an American rapper, record producer, an DJ. 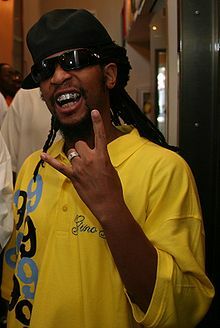 He wis the frontman o the group Lil Jon & The East Side Boyz, which he formed in 1995, an thay released several albums until 2004. Efter going solo, he released a new album in 2010 teetled Crunk Rock. He wis featured on Celebrity Apprentice durin its 11th an 13th seasons. ↑ Birchmeier, Jason (2006). "Lil Jon – Biography". Allmusic. Retrieved April 11, 2008.